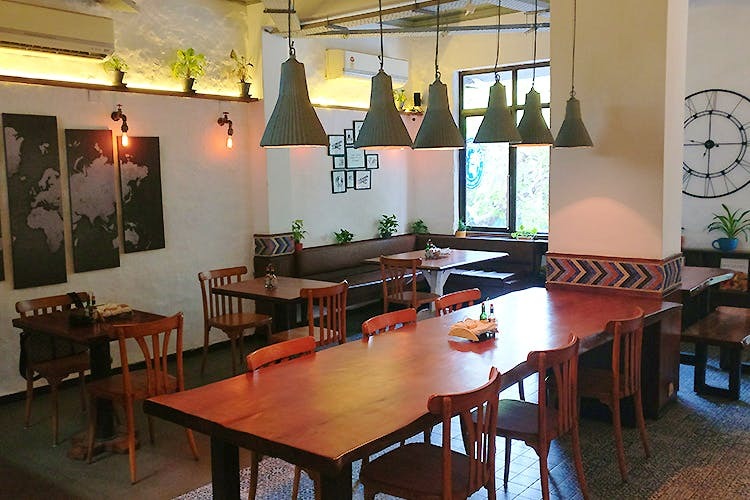 The latest addition to the chill, cafe-type bars in Khan Market is Immigrant Cafe and it’s got a relaxing ambience, an experimental menu and is perfect for when you want a place to catch up with your BFFs. A little over a month old, the place is a sister cafe to the one in CP, only a bigger and better version of it. Staying true to its name, the decor is full of experimental elements including industrial lights, multi-canvas world maps and wall installations made out of pipes and empty whiskey bottles. There are two floors, and both are warmly-lit and quite welcoming, but we chose the second one because of our weakness for balconies. The menu is full of familiar, desi dishes with a modern twist. We tried a few from the appetisers menu including Pindi Dounuts, Hummus Platter With Pita, Butter Chicken Samosa as well as the Sweet Greek Watermelon Salad. The Hummus Platter came with three types of hummus that were perfectly creamy and delicious. It was that and their salad that won us over. The others TBH, you can skip. We recommend washing it all down with cold beers or cocktails like margarita or daiquiri (We tried both, and couldn’t find anything to complain about). Make sure to check what size you’re ordering, since the menu only states the price for a regular. Teetotallers, there are plenty of options for you as well. The vibe, cocktails and the music are perfect for actually having a real conversation. You may not even realise it, but by the time you leave, you might end up quite buzzed (we can attest to that! ).